The Waldorf STVC String Synthesizer and Vocoder is a desktop synthesizer offering a 49-note keyboard and vocoding features. 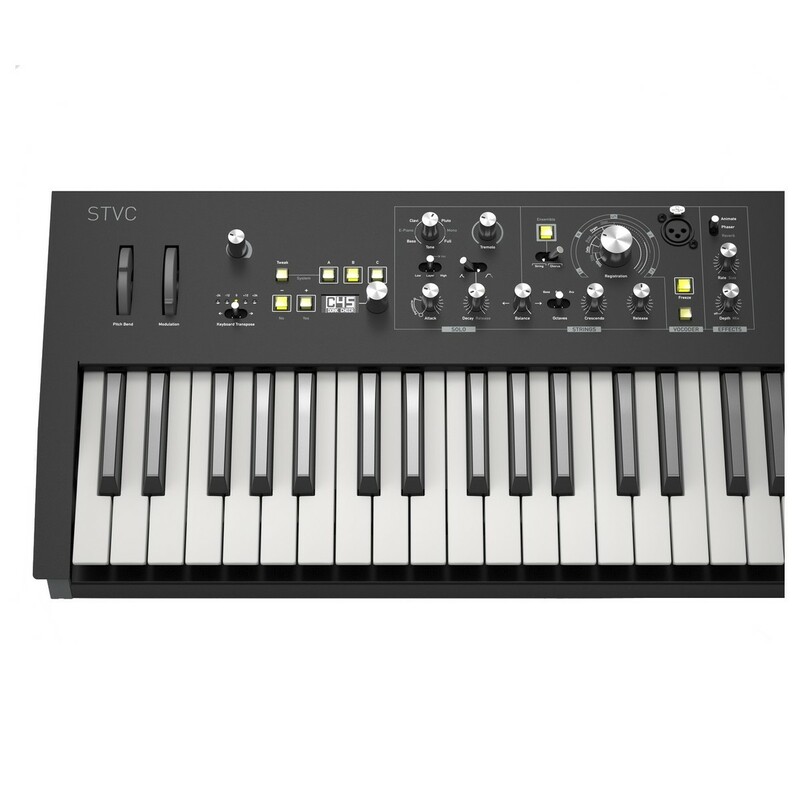 The Waldorf STVC takes its inspiration from the Waldorf Streichfett string synthesizer, however adds a keyboard and vocoder for more flexibility ad functionality. Included is a gooseneck microphone, which allows you to combine synth playing and voice-changing effects at the same time. With a rugged metal chassis construction, the Waldorf STVC ensures durability and longevity. 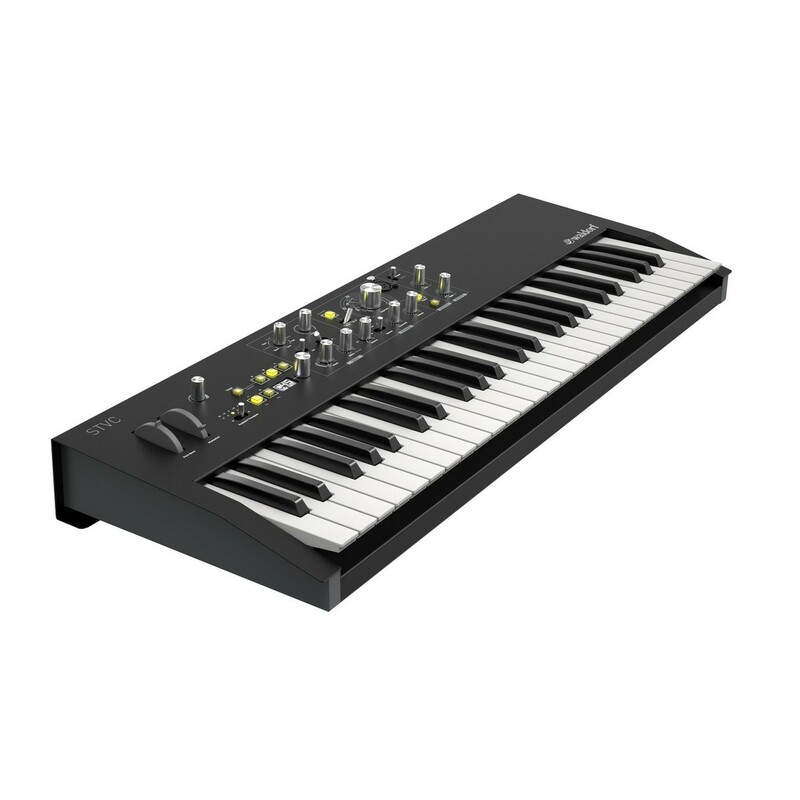 The Waldorf STVC String Synthesizer and Vocoder features a full metal case, which ensures durability. 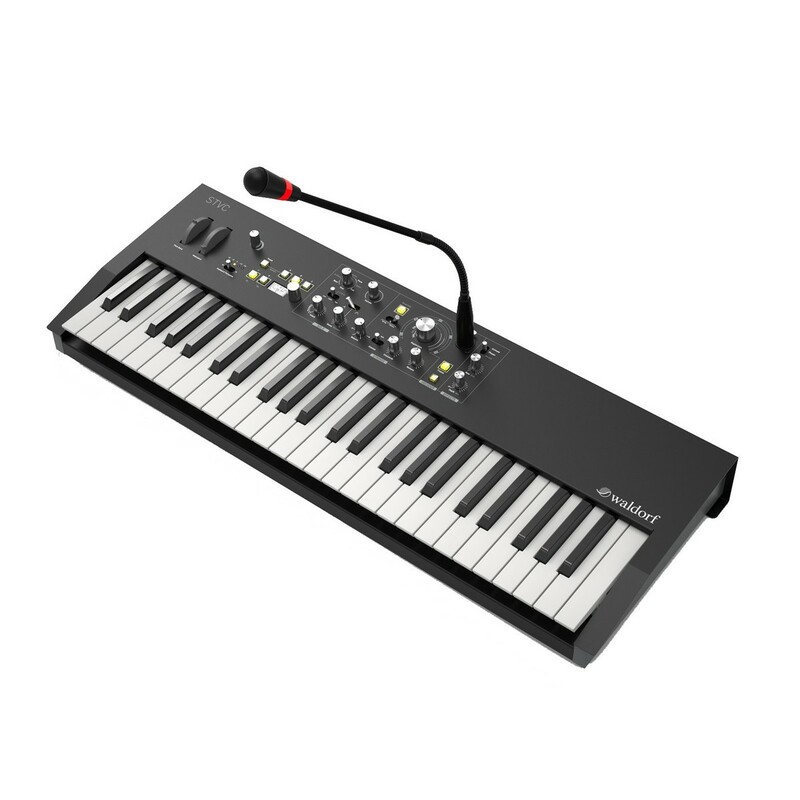 It offers 49 keys with aftertouch and velocity for an expressive performance. It also offers pitch and modulation wheels for creating pitch bends and modulation on-the-fly, plus a number of potentiometers, an encoder, backlit buttons and switches for shaping and switching sounds. The Waldorf STVC offers an oscillator bank using octave dividers, complete with a mixer and equalizer for shaping and mixing your sound. A single registration knob sweeps through the mixer and EQ settings for a range of sounds including violin, viola, cello, brass, organ and choir, and more, ideal for creating smooth, rich and creamy sonic textures. The Walford STVC features a fully polyphonic string section offering an oscillator bank, complete with a mixer, EQ, and ensemble effect, reimagining the function of 70’s string machines into a modern reproduction. It offers 126 programmable patches in 3 banks, and a 16-voice synthesizer section that will complement the string sounds. A single tone knob allows you to switch between the many useful settings. Combine the string and synth sounds to create your own thick, rich and full evolving textures, ideal for spacey sci-fi films, retro, and more. The STVC allows you to create vocoder effects with your own voice through the included gooseneck microphone. It connects to the top panel of the STVC so you can easily speak into the microphone and play at the same time. The vocoder replaces the EQ section of in the string section with the filter bank that models the vocal tract from the speech input. The formants of your speech can be modified up or down, allowing you to create high pitched and low pitched vocoding effects. There is also optional jitter for the string oscillators, and a freeze mode that lets you freeze a short fragment of speech, which is then repeated by the vocoder when your press a key. The Waldorf STVXC comes loaded with a range of effects including reverb, phaser, and ensemble/chorus, allowing you to create powerful and evolving textures with ease. There is a novel tweak section that allows you to modify the modulation of details such as the solo cutoff frequency of the chorus LFO rate. The reverb effect also features adjustable size. Combine the reverb, with the phaser and animate effects simultaneously to create a warping, evolving texture.